The Persian Gulf is a semi-enclosed shallow marine environment with a mean depth of about 35 meters lying in a subtropical and hyper-arid region in the northwestern Indian Ocean. It is considered a young sea (~15,000 years) with an impoverished biodiversity. Biota living in the Gulf must adapt to high temperatures and a hypersaline environment. Sea surface temperature in the Gulf varies from 18 to 34°C throughout the year and salinity is more than 39 ppt in most areas. Populations of sea snakes in the Persian Gulf are peculiar because the Gulf is the westernmost extent of sea snakes (with the exception of H. platurus, which is also found in the east coast of Africa) and because the Persian Gulf can be considered as an excellent natural laboratory to study the adaptive responses of the rapidly evolving sea snakes to high salinities and fluctuating temperatures. Extant knowledge of sea snake diversity in the Persian Gulf and its adjacent waters is based on studies by Smith and Volsøe in the first half of the 20th century. They documented nine species of sea snakes in the area. Recently, taxonomy of the true sea snakes has been revised based on comprehensive molecular phylogenetic analyses allocated to the genera Enhydrina Gray, 1849, Lapemis Gray, 1835 and Pelamis Daudin, 1803 to the single genus Hydrophis and the Small-headed Sea Snake previously known as Hydrophis gracilis is now assigned to the genus Microcephalophis. A series of field surveys carried out in 2013 and 2014 throughout Iranian coastal waters of both gulfs did a comprehensive sampling of sea snakes in the area. 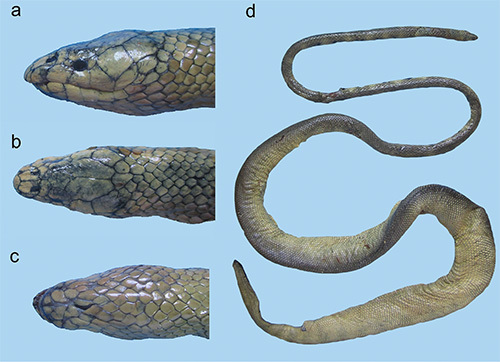 In a new paper by Rezaie-Atagholipour and colleagues (2016) presents an illustrated and updated checklist and identification tool for sea snakes in the Persian Gulf and Gulf of Oman The list is based on new material and a review of the literature. This checklist includes ten species of marine hydrophiines, of which one, Microcephalophis cantoris (Günther, 1864), is a new record for the area.